Rock Church and Sea Fortress Suomenlinna are good opportunities to explore the local culture. For shopping fun, head to Market Square Kauppatori or Artisaani. 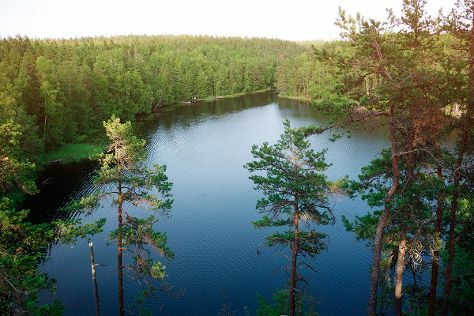 Venture out of the city with trips to Teijo national park (in Pernio), Jarvenpaan Taidemuseo (in Jarvenpaa) and Nuuksio National Park (in Espoo). Pack the 25th (Thu) with family-friendly diversions at Linnanmaki Amusement Park. There's much more to do: pause for some serene contemplation at Helsinki Cathedral, take in the spiritual surroundings of Uspenskin Cathedral (Uspenskin Katedraali), take a stroll through Katajanokka, and steep yourself in history at Seurasaari Island and Open-Air Museum. To find traveler tips, where to stay, and other tourist information, go to the Helsinki online tour planner . If you are flying in from United States, the closest major airport is Helsinki Vantaa Airport. In July, daily temperatures in Helsinki can reach 71°F, while at night they dip to 55°F. Cap off your sightseeing on the 28th (Sun) early enough to travel back home.